I read this out loud to the group, and downloaded images of Kintsugi into a slide show, so they could view images of Kintsugi as I read to them. The literal translation of Kintsugi is “golden joinery” or “to patch with gold.” This Japanese technique may have begun in the late 15th century, when a famous shogun sent a damaged Chinese tea bowl back to China to be fixed. It was returned held together with ugly metal staples, so Japanese craftsmen had to find a form of repair that could make a broken piece look as good as new, or better. The results were so astonishing that Japanese collectors were accused of deliberately breaking prized ceramics, just to have them mended in gold. The very rupture is what is highlighted. The practice—it is believed—renders the piece even more beautiful than it started out. The idea behind it is not to hide the ugliness and brokenness but instead to use gold to make it shine; to illuminate and expose the damage. 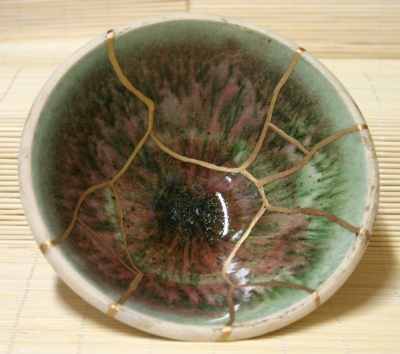 And at the end of the process, the piece is even more beautiful having been broken. How much can you love that part of yourself that has been broken? The hairline fracture in the fifth metatarsal that keeps you from running long distances, that scar down the center of your chest? How do you turn that experience of loss and fragility on its head and see the cracks lined with gold? You do not want to be called a survivor. So we will find new ways to name you, because here you are, sitting with us, a glass in your hand, asking about the vintage, the varietal, the winery. Or you’re buying expensive cheese under the white canvas umbrella at the farmer’s market, the air outside warm on your skin. Your skin. That body you live inside that houses your whole life. Here’s how you return to the broken parts: in dreams, in moments of hopelessness, standing at your kitchen sink, weeping silently. Those scars you carry are heavy, aren’t they? But so is the awareness that you are here, after all you’ve been through, and you want more, every day, you want more. The human spirit is resilient. You’ve heard that a thousand times. But how many stories of courage and tenacity do you need to hear before you acknowledge that you are living proof? You sometimes wanted to die, but you didn’t. You thought it was coming to an end, but it went on. Don’t minimize any of it, most of all the people whom you loved, who loved you fiercely in return. Don’t wave it off like an annoying gnat simply because you wish it wasn’t some version of the scarlet letter that is all your own. You long to say, “That terrible loss didn’t happen to me,” only because you do not want to be defined by it. You want to be all that you are in addition to the suffering; back then it seemed it would break you for good. But it didn’t. Can you see instead what you are, all that you are, sans the labels of heroics or the shame and sadness? It’s a difficult daily practice, and of course you have other choices, but can you hold the brokenness and the wholeness at once, seeing yourself here, always circling back, to seeing yourself here, at last?